Hero Victory Venkatesh was the chief guest at Jersey’s pre-release event that was held tonight. 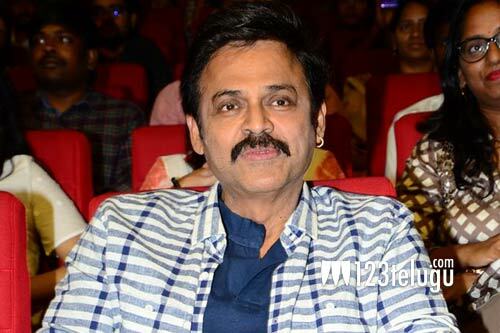 Speaking on the occasion, Venky had some nice things to say about the film and Nani. Venky said that he was quite impressed with Jersey’s trailer and that movies like Jersey inspire us to never give up on our dreams. Talking about Nani, Venky said that Nani is one of the very few natural actors in Tollywood and that his fans should be proud of the Natural Star. The senior hero further said that he is confident that Nani and the film’s team will surely give an emotional outing in cinemas. Jersey is directed by Gowtam Tinnanuri and produced by Naga Vamsi. Shraddha Srinath is the film’s leading lady. Jersey is slated for release on April 19.